Pulitzer-Prize winning food critic Jonathan Gold, who wrote lyrically and passionately about everything from taquerias to the world's finest restaurants, has died. He was 57. The loss will be felt deeply in the city of Los Angeles and by food lovers everywhere. Gold, a Los Angeles native, had just recently been diagnosed with pancreatic cancer. He died at an L.A. hospital surrounded by family. "One of the greatest in L.A." said Mayor Eric Garcetti on hearing the news. "A man who made L.A. soar. Who articulated this moment. Who was Los Angeles in many ways." It would be difficult to overstate Gold's impact on the culture of food in Southern California. His reviews of L.A.'s restaurants drew international attention to the region's unique fusion of cultures. But he also saw it as a mosaic, an "anti-melting pot," where immigrants opened restaurants that maintained the unique flavors of home without having to bow to American palates. "The idea that you have all these communities, and all these viewpoints, and all these histories coming together in sort of this vast glittering fabric," he said in an interview with Take Two when the 2016 documentary about his life "City of Gold" was released. He celebrated the kitchens of the fanciest restaurants and food trucks alike. Here's what the late Anthony Bourdain had to say about Gold during a trip to L.A. for his web series "Little Los Angeles:"
"It's Jonathan Gold country, you know? He was really the first guy to change the focus from white tablecloth restaurants to really cool little places in strip malls. I mean, he was working that beat for a really long time. Won a Pulitzer for it. Rightfully so." In his L.A. Times' bio he bragged that he was "delighted that he has managed to forge a career out of the professional eating of tacos." An instantly recognizable figure around the city for many — even before he gave up at least the illusion of anonymity maintained by most food critics — Gold stood out from other restaurant critics early by discovering culinary wonders in places that others wouldn't look. His passion for his work came out when he talked about his process for reviewing. "Taking notes while you're eating is like taking notes while you're making love," he said. "You can do it , but you lose something." "There are definitely moments when you're eating with me that I will be in a trance state. I'll be trying to think about things and think about how the way that things get put together... But one of my problems with a lot of food writing is that so much of the music of it gets buried in the details of the ingredients or the preparation of someone trying to puzzle out how a certain dish gets put together. It's like going to the philharmonic and going to hear Mahler and worrying about his use of the suspended second. Maybe it's part of it, but it doesn't really tell you anything. You're better off just listening to the music." Gold was a good friend to public radio. He co-hosted KCRW's "Good Food On The Road." And he was a frequent guest on KPCC. Just a few weeks ago, ahead of the quintessentially L.A. matchup of South Korea and Mexico in the World Cup, he came into the station to talk about the rich intersection of those two cultures. After he finished taping the interview, Gold reminded editors that he lived close by and was always happy to help out. It wasn't just talk, he meant it. That was Gold. He was naturally shy, but acutely aware how much it meant to people eager for the chance to meet him. And he was generous with his time, patiently listening to fans, many of them giddy with excitement, and always up for a selfie. Nice Lady at #JGold101 Food Event: "Oh! Phil??" Six years ago, Gold was lured back to the L.A. Times, where he got his start after graduating from UCLA. He'd been writing for L.A. Weekly since 1984. His singular column on food began two years later. Even its title foreshadowed that he'd be different. He called it "Counter Intelligence." And it was in that role that his distinctive best restaurant list — Jonathan Gold's 99 Essential L.A. Restaurants — became a bible for foodies. 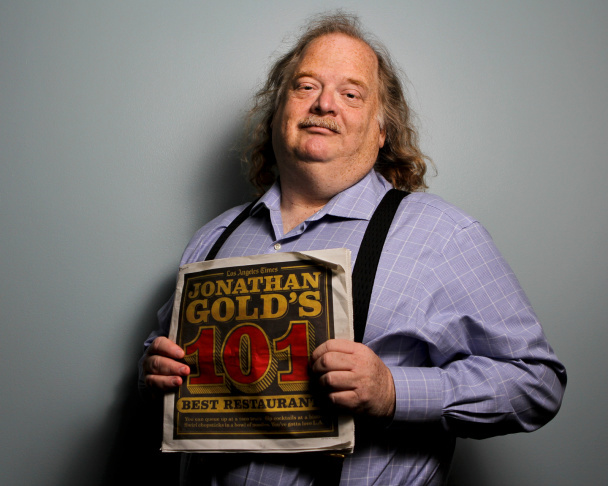 When he moved to the L.A. Times he expanded the list by two and it became Jonathan Gold's 101 Best Restaurants. He knew he held tremendous power to make, or break, an establishment. A negative review from him had the potential to put many low-wage people out of work. Even when he didn't like a place, he tried to understand why other people might. In one case, he returned to a crowded Taiwanese restaurant 16 or 17 times to see if the unfamiliar flavors grew on him. "I realized that the food wasn't like this, because they were bad cooks. My ideas of it were because of my cultural relativism," he told NPR's Renee Montagne in 2016. "It wasn't food that I was used to eating." His ultimate ruling? He just didn't crave the food. And that was OK because he came to understand it. "And I think in a lot of ways that's more valuable than if I'd just gone in there and made cheap jokes at the expense of the food," he said, "or I'd given it a bad review because I thought it was bad." Reading his reviews was like listening to friends talk about the best meals they'd ever eaten. "When it is 109 degrees in Pasadena, when the live oaks droop and the front range of the San Gabriels burns with a terrible heat, there is no better place to be in the city than the shaded courtyard of the Pacific Asia Museum, among the Japanese statues and the swimming koi, the muscular Myron Hunt architecture, and the frail cart that houses Bulgarini Gelato, whose pistachio is fragrant as a lyric poem, whose lemon tames the sun, whose peach-moscato sorbetto is even more delicious than a chilled Bellini, even more delicious than a chilled Bellini made from a peach you have plucked from your own tree." Gold was 57. He is survived by his wife Laurie Ochoa, an editor at the L.A. Times, and a son and daughter.